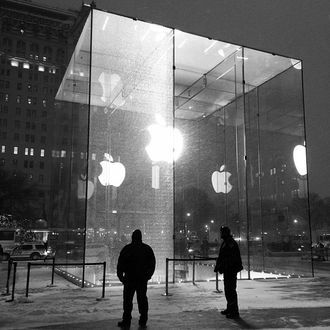 The illuminated glass cube that dramatically marks the flagship Apple store on Fifth Avenue near Central Park cracked yesterday when a snowblower bumped into a 32-foot-tall pane, Buzzfeed reports. Thanks, De Blasio. On the bright side, for a small window of time, the tourist photos taken out front will be slightly more interesting.